Watercolour of illuminations at Fatehgarh from 'Views by Seeta Ram from Agra to Barrackpore Vol. X' produced for Lord Moira, afterwards the Marquess of Hastings, by Sita Ram between 1814-15. Marquess of Hastings, the Governor-General of Bengal and the Commander-in-Chief (r. 1813-23), was accompanied by artist Sita Ram (flourished c.1810-22) to illustrate his journey from Calcutta to Delhi between 1814-15. 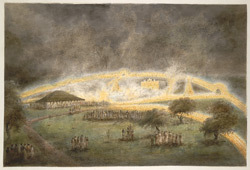 Illuminations and fireworks round Mr. Donnithorne's park at Fatehgarh. Fatehgarh, located near Farrukhabad in Uttar Pradesh, passed to the British in 1802 and was set up as a head-quarter for one of the Governor-General's agents. Mr. Donnithorne was the collecor and mint-master at Fatehgarh. Inscribed below: 'Illuminations on the 12th. of August at Futtehghur.' Note: August 12th was the Prince Regent's birthday.